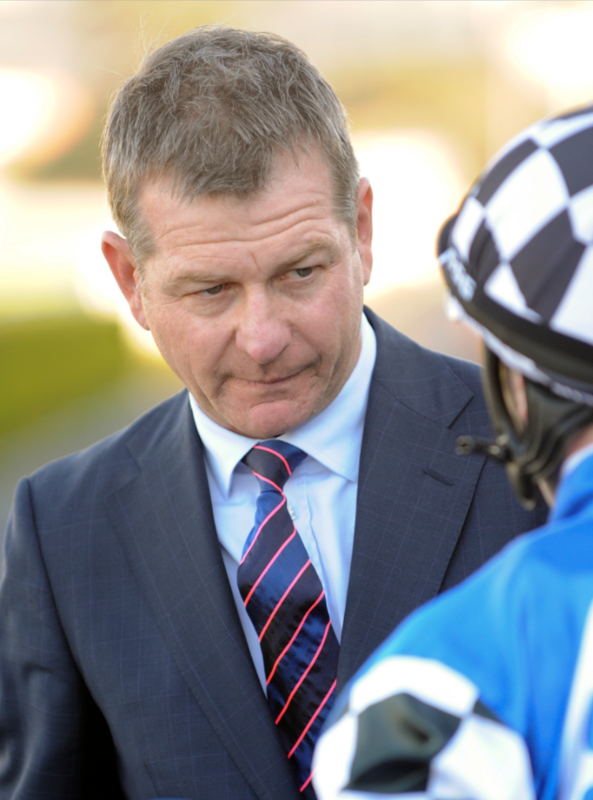 Kris Lees has accepted with seven of his team for Thursday’s Newcastle race meeting and he has nominated three-year-old filly Evalina as his best chance. Evalina resumes in the 900 metre 3YO Maiden Plate and the filly is the $4.50 equal favourite on TAB fixed odds. Evalina is raced by Lib Petagna who owned Lees former Group 1 star, Lucia Valentina. This filly debuted at Newcastle on April 14 when she was runner-up in a two-year-old race. Evalina has won two recent barrier trials, the last of which she led throughout to beat boom filly Miss Fabulass (won at Canterbury Park today) at Gosford on August 6. Miss Fabulass could have won the trial comfortably if she was given rein, however, the third horse in the trial was six lengths away. Lees discussed his Newcastle runners on Wednesday: “I have accepted at both Newcastle and Taree with Peyton Place, Grand Bouquet and Grand Soleil and I will make a decision on where they head later. The other four are Progression, Cuban Sizzle, Evalina and Sunreel will run at Newcastle. "Evalina is a smart filly and she is my best chance. She bolted in with a Beaumont trial on July 27 and she was impressive at Gosford in her last trial. Evalina is speedy and the 900 metres first-up is ideal. Progression hasn’t raced for five weeks because she has drawn wide barriers and I scratched her a couple of times. "James McDonald rides her and she will be hard to beat in this race. Cuban Sizzle will oppose Progression and she has good speed. This is her first start for our stable and the short course and the claim gives her a chance. "Sunreel is a progressive filly and steps up in trip. She won a mediocre maiden at Kempsey last start, but she put them away nicely. It’s a rise in class but the filly only has to carry 54½ kilograms,” Lees said. James McDonald returns to Newcastle on Thursday for the first time since his 18-month suspension. The former Kiwi has six rides on Thursday including four for Sydney’s Premier trainer Chris Waller. The latter’s runners are Given Time, Semper Fidelis, Scratches and Joy Forever. All four are well fancied in early markets, with Semper Fidelis and Given Time favourite and second favourite respectively. Semper Fidelis is raced by Gresford breeder John Cornish and the mare is resuming on the back of a nice recent trial. She was runner-up at Warwick Farm and Gosford in autumn and this is a winnable race for her. Given Time is fitter for his first-up run at Hawkesbury. He was only beaten a length by the smart Bondi in a Newcastle Maiden in March. McDonald also rides Progression for Kris Lees and Watching for Anthony and Edward Cummings. Paul Perry will saddle up promising colt Salsa Man, the early favourite in the opening event, a 1500 metre class 1 Handicap. The three-year-old has good credentials for this race as he was runner-up two starts back at Warwick Farm and he was a close fourth at Rosehill three weeks ago. The Waterhouse-Bott training partnership will saddle up two early favourites on Thursday. The speedy Kooza steps up to the 1850 metres in the Maiden Plate after a close third recently at Kembla. Aeecee Tong De, a beaten favourite at Newcastle last Saturday, backs up in the 1500 metre Class 1 Handicap. The mare was run down in the shadows of the post on Saturday.